Let Ozumo orchestrate an indulgent evening for occasions of any size. We offer a custom curated menu in each of our modern settings. The Main Dining Room at Ozumo truly complements elegant, contemporary and authentic Japanese cuisine. Surrounded by windows this room features one of the most impressive views of the San Francisco Bay Bridge providing the perfect sillouette for a fine dining experience. This gracefully designed dining room is available for a seated lunch or dinner for up to 80 guests (120 with Robata Dining Room). Our newly renovated Sake Lounge boasts a modern and sleek decor. This casually stylish space is available for cocktail parties and casual gatherings for up to 100 people. The Sake Tasting private dining room is the perfect setting for any event that requires a more intimate setting to entertain up to 20 very special guests. 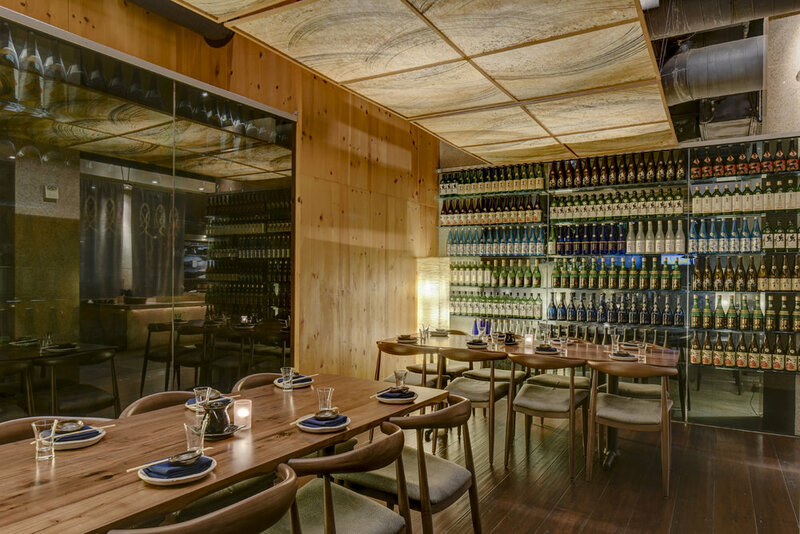 The room is gracefully designed and enclosed in glass walls that are dramatically lined with bottles of sake featured on the extensive sake menu. The Robata Dining room is a cozy, intimate setting featuring our open kitchen and robata grill. Translated as “around the fireplace,” robata taps into the ancient Japanese custom of cooking in the irori, the traditional charcoal-fired hearth once found in every home. The Robata Dining room is a semi-private space which can accommodate up to 37 seated guests. The Kotatsu Room is the picture of modern elegance combined with the intimacy of a traditional Japanese style seating environment. Guests are invited to remove their shoes, comfortably sink into their seat and simply let the staff attend to their every need.